Annie Kendall arrives at London's Bristol House to research ancient artifacts from the Holy Land. Her flat has two remarkable features: a stunning black-and-white mural of London scenes, and--apparently--the ghost of a Carthusian monk who leaves mysterious traces and refuses to be banished. Hollowed out by loss and regret, and desperate to change her life and put her career back on track, Annie is determined to ignore the mysteries that slowly gather her into their net. This riveting dual-period narrative seamlessly bends a haunting supernatural thriller with the vivid history of Tudor London, a place where monks are being executed, Jews have been banished, and the power of Henry VIII and Thomas Cromwell reaches into every corner of the kingdom. Annie's search leads her to unravel the twists of time and emerge as a woman strengthened by the mysteries of what we can and cannot know, able to forgive herself for the past, and trust in love in the future. This is not the book I thought it would be. Even with a summary describing it as "thriller," I still expected something more quaint, more--well--English. I won't go into the specifics of the plot as I don't think I can do so without spoiling any of it, but this is a book that I could not put down. Swerling does an excellent job of walking that line between an action-driven and a character-driven book and ends up with a perfect specimen of a plot-driven book. There is plenty of action, of course...but there are also wonderful characters. Annie is a believable heroine; haunted by her past mistakes and trying to get her life on the right path. Geoff isn't the most original character, but he's believable and right for the story. My favorite character had to be Maggie, Geoff's octogenarian mother. 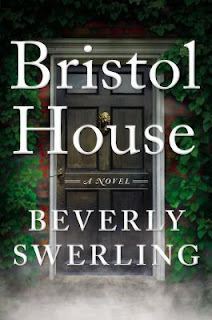 In many ways, Bristol House is similar to a Dan Brown book--although Bristol House is far better than anything Brown has ever written. The plot is built on religious beliefs through history and tied to current events. Bristol House also has a supernatural element, which I really enjoyed but others may not. I wouldn't call Bristol House a beach read--it was great fun, but it wasn't what I would consider "light." If you are looking for something fun that calls one you to use some brain cells, Bristol House is for you. I was not solicited for this review. All opinions are mine and mine alone and I received no compensation for this review. This sounds good. I've read Dan Brown's The Da Vinci Code and thought it was a good read, so this looks just up my alley. It's nice to know that there's some supernatural stuff going into it, it doesn't throw you off then once it happens. Right now I'm starting The Windup Girl, so we'll see how that one is. It's won a ton of awards, so it must be good. I haven't read a book for a while, I need to get back into it. this plot sounds great! i love tying in both old thought and current events.